Die Lunæ, videlicet, 9 die Maii. Message from the H. C. to send for Hyliard, for Contempt. Collection of Contribution for Ireland in Bristol. Dr. Hacket's to be elected a Canon Residentiary of St. Paul's. and for a Conference about the Magazine at Monmouth. Order for Ordnance to be sent to Munster. Order for quelling Riots in the Earl of Lindsey's Level in Lincolnshire. Report of the Messengers that were sent to attach Sir Thomas Darrel, Sir John Hales, and Sir Tho. Metham. The King will not suffer them to be attached till He has Satisfaction against Sir John Hotham. Sheriff of Yorkshire ordered to attach them. Committee to consider of this Business. Message to the H. C. to acquaint them with it, and for Committees to meet about it. Col. Beeling and Mr. Magennis's Petition for a Maintenance in The Tower. Message from the H. C. about naming the evil Counsellors. For Members of both Houses to be present To-morrow at the Review of the London Militia. To consider of the Grievances and their Remedies. For Expedition to the Commission for the Sea Adventurers for Ireland; and for Sir Ed. Loftus to be Deputy Lieutenant of Yorkshire. A Message was brought from the House of Commons, by William Stroude, Esquire, &c.
To let their Lordships know, that the House of Commons have received Information from the Committees of Parliament in Yorkshire, that the Orders of Parliament are contemned and disobeyed, and Mr. Robert Hyliard is a principal Agent in it; therefore, it being a Business that so much concerns the Dignity of the Parliament, the House of Commons desires their Lordships Concurrence, that it may be referred to the Consideration of that Committee that is appointed to draw up an Answer to the King's last Message; and that their Lordships would please to send for the said Robert Hyliard, to answer his Misdemeanors. Ordered, That this House concurs with the House of Commons, in referring this Business to the same Committee as is appointed for to draw up an Answer to the King's last Message; and that the Gentleman Usher of this House, or his Deputy, shall attach the Body of Robert Hyliard, Esquire, and forthwith bring him before the Lords in Parliament, to answer such Matters as he stands charged (fn. 1) with in Parliament; and that the Committees of both Houses remaining in Yorke shall send up such Witnesses as are to testify in this Cause, and see that this Order be put into Execution. That this House agrees with the House of Commons, in referring the Consideration of this Business to the same Committee as is desired; and that this House had sent for Robert Hyliard, Esquire, to answer his Offence to the Parliament. Ordered, That William Hawkes, now a Prisoner in The Fleet, having performed that Part of his Censure that was not remitted, shall forthwith be released of his Imprisonment, paying his Fees. "To the Gentleman Usher, or his Deputy, to be delivered to the Warden of The Fleet, or his Deputy." 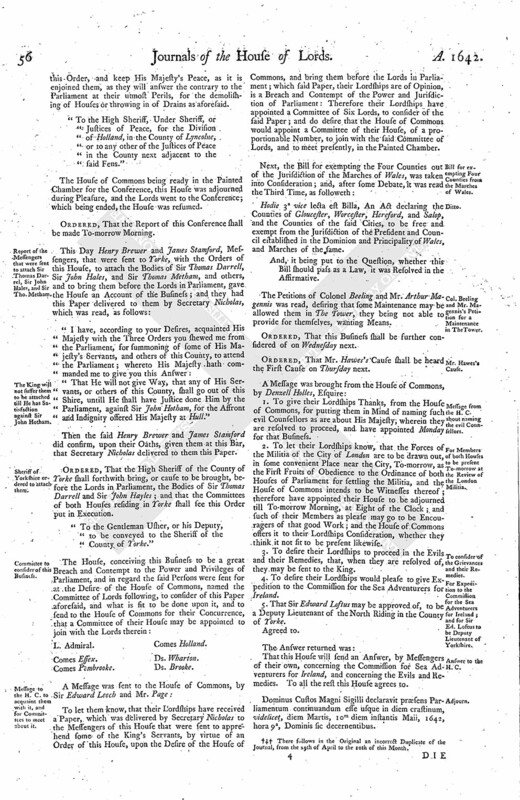 "It is this Day Ordered, by the Lords and Commons in Parliament assembled, That the Collectors and Receivers of the Contribution-money for Ireland, within the City of Bristoll, do detain such Monies in their Hands as are gathered upon that Act; and that John Lock, Mayor of Bristoll, John Gunning, Alderman, John Tomlynson, Andrew Carlton, Richard Holworthy, Ezechiell Wallis, Aldermen, and Richard Aldworth, Merchant, shall be authorized to dispose of and distribute the said Monies, so collected, to such distressed Protestants as are fled out of Ireland to that City; and to take a Note of the several Names of such Persons to whom they distribute the same, and what Sums they do severally distribute; and that they do make a Certificate thereof to the Houses, as also of what Sums in the Total they do collect by virtue of the Act of Contribution." 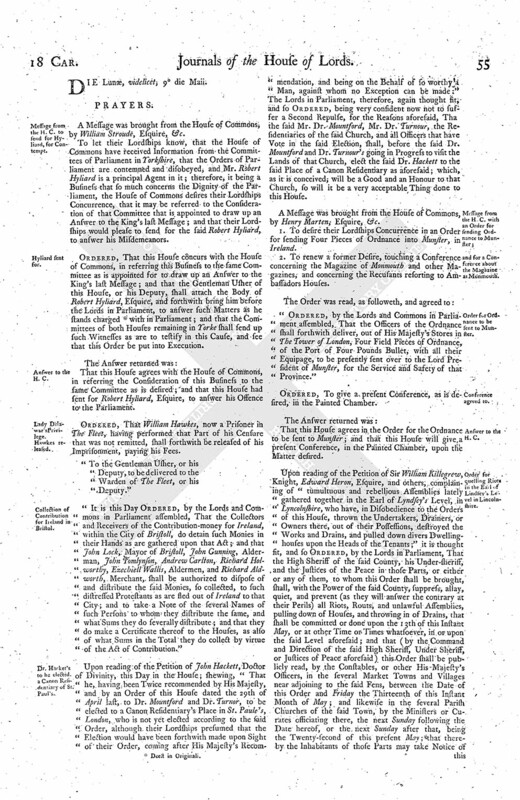 Upon reading of the Petition of John Hackett, Doctor of Divinity, this Day in the House; shewing, "That he, having been Twice recommended by His Majesty, and by an Order of this House dated the 29th of April last, to Dr. Mountford and Dr. Turnor, to be elected to a Canon Residentiary's Place in St. Paule's, London, who is not yet elected according to the said Order, although their Lordships presumed that the Election would have been forthwith made upon Sight of their Order, coming after His Majesty's Recommendation, and being on the Behalf of so worthy a Man, against whom no Exception can be made:" The Lords in Parliament, therefore, again thought fit, and so Ordered, being very confident now not to suffer a Second Repulse, for the Reasons aforesaid, Tha the said Mr. Dr. Mountford, Mr. Dr. Turnour, the Residentiaries of the said Church, and all Officers that have Vote in the said Election, shall, before the said Dr. Mountford and Dr. Turnour's going in Progress to visit the Lands of that Church, elect the said Dr. Hackett to the said Place of a Canon Residentiary as aforesaid; which, as it is conceived; will be a Good and an Honour to that Church, so will it be a very acceptable Thing done to this House. A Message was brought from the House of Commons, by Henry Marten; Esquire, &c.
1. To desire their Lordships Concurrence in an Order for sending Four Pieces of Ordnance into Munster, in Ireland. 2. To renew a former Desire, touching a Conference concerning the Magazine of Monmouth and other Magazines, and concerning the Recusants resorting to Ambassadors Houses. "Ordered, by the Lords and Commons in Parliament assembled, That the Officers of the Ordnance shall forthwith deliver, out of His Majesty's Stores in The Tower of London, Four Field Pieces of Ordance, of the Port of Four Pounds Bullet, with all their Equipage, to be presently sent over to the Lord President of Munster, for the Service and Safety of that Province." Ordered, To give a present Conference, as is desired, in the Painted Chamber. That this House agrees in the Order for the Ordance to be sent to Munster; and that this House will give a present Conference, in the Painted Chamber, upon the Matter desired. Upon reading of the Petition of Sir William Killegrew, Knight, Edward Heron, Esquire, and others, complaining of "tumultuous and rebellious Assemblies lately gathered together in the Earl of Lyndsey's Level, in Lyncolnshire, who have, in Disobedience to the Orders of this House, thrown the Undertakers, Drainers, or Owners there, out of their Possessions, destroyed the Works and Drains, and pulled down divers Dwellinghouses upon the Heads of the Tenants;" it is thought fit, and so Ordered, by the Lords in Parliament, That the High Sheriff of the said County, his Under-sheriff, and the Justices of the Peace in those Parts, or either or any of them, to whom this Order shall be brought, shall, with the Power of the said County, suppress, allay, quiet, and prevent (as they will answer the contrary at their Perils) all Riots, Routs, and unlawful Assemblies, pulling down of Houses, and throwing in of Drains, that shall be committed or done upon the 13th of this Instant May, or at other Time or Times whatsoever, in or upon the said Level aforesaid; and that (by the Command and Direction of the said High Sheriff, Under Sheriff, or Justices of Peace aforesaid) this Order shall be publicly read, by the Constables, or other His-Majesty's Officers, in the several Market Towns and Villages near adjoining to the said Fens, between the Date of this Order and Friday the Thirteenth of this Instant Month of May; and likewise in the several Parish Churches of the said Town, by the Ministers or Curates officiating there, the next Sunday following the Date hereof, or the next Sunday after that, being the Twenty-second of this present May; that thereby the Inhabitants of those Parts may take Notice of this Order, and keep His Majesty's Peace, as it is enjoined them, as they will answer the contrary to the Parliament at their utmost Perils, for the demolishing of Houses or throwing in of Drains as aforesaid. "To the High Sheriff, Under Sheriff, or Justices of Peace, for the Division of Holland, in the County of Lyncolne, or to any other of the Justices of Peace in the County next adjacent to the said Fens." Ordered, That the Report of this Conference shall be made To-morrow Morning. "That He will not give Way, that any of His Servants, or others of this County, shall go out of this Shire, untill He shall have Justice done Him by the Parliament, against Sir John Hotham, for the Affront and Indignity offered His Majesty at Hull." Then the said Henry Brewer and James Stamford did confirm, upon their Oaths, given them at this Bar, that Secretary Nicholas delivered to them this Paper. Ordered, That the High Sheriff of the County of Yorke shall forthwith bring, or cause to be brought, before the Lords in Parliament, the Bodies of Sir Thomas Darrell and Sir John Hayles; and that the Committees of both Houses residing in Yorke shall see this Order put in Execution. "To the Gentleman Usher, or his Deputy, to be conveyed to the Sheriff of the County of Yorke." To let them know, that their Lordships have received a Paper, which was delivered by Secretary Nicholas to the Messengers of this House that were sent to apprehend some of the King's Servants, by virtue of an Order of this House, upon the Desire of the House of Commons, and bring them before the Lords in Parliament; which said Paper, their Lordships are of Opinion, is a Breach and Contempt of the Power and Jurisdiction of Parliament: Therefore their Lordships have appointed a Committee of Six Lords, to consider of the said Paper; and do desire that the House of Commons would appoint a Committee of their House, of a proportionable Number, to join with the said Committee of Lords, and to meet presently, in the Painted Chamber. Hodie 3a vice lecta est Billa, An Act declaring the Counties of Gloucester, Worcester, Hereford, and Salop, and the Counties of the said Cities, to be free and exempt from the Jurisdiction of the President and Council established in the Dominion and Principality of Wales, and Marches of the same. And, it being put to the Question, whether this Bill should pass as a Law, it was Resolved in the Affirmative. The Petitions of Colonel Beeling and Mr. Arthur Magennis was read, desiring that some Maintenance may be allowed them in The Tower, they being not able to provide for themselves, wanting Means. Ordered, That this Business shall be further considered of on Wednesday next. Ordered, That Mr. Hawes's Cause shall be heard the First Cause on Thursday next. 1. To give their Lordships Thanks, from the House of Commons, for putting them in Mind of naming such evil Counsellors as are about His Majesty, wherein they are resolved to proceed, and have appointed Monday for that Business. 2. To let their Lordships know, that the Forces of the Militia of the City of London are to be drawn out, in some convenient Place near the City, To-morrow, as the First Fruits of Obedience to the Ordinance of both Houses of Parliament for settling the Militia, and the House of Commons intends to be Witnesses thereof; therefore have appointed their House to be adjourned till To-morrow Morning, at Eight of the Clock; and such of their Members as please may go to be Encouragers of that good Work; and the House of Commons offers it to their Lordships Consideration, whether they think it not fit to be present likewise. 3. To desire their Lordships to proceed in the Evils and their Remedies, that, when they are resolved of, they may be sent to the King. 4. To desire their Lordships would please to give Expedition to the Commission for the Sea Adventurers for Ireland. 5. That Sir Edward Loftus may be approved of, to be a Deputy Lieutenant of the North Riding in the County of Yorke. That this House will send an Answer, by Messengers of their own, concerning the Commission for Sea Adventurers for Ireland, and concerning the Evils and Remedies. To all the rest this House agrees to. Dominus Custos Magni Sigilli declaravit præsens Parliamentum continuandum esse usque in diem crastinum, videlicet, diem Martis, 10m diem instantis Maii, 1642, hora 9a, Dominis sic decernentibus. 2. There follows in the Original an incorrect Duplicate of the Journal, from the 29th of April to the 10th of this Month.